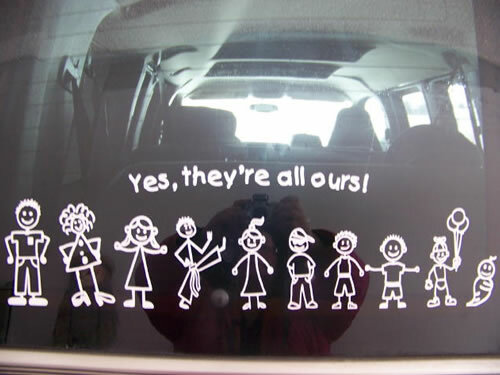 I have a stick family on my mini van. And yes I toyed with the fanciness of the characters and which to choose for whom. After much thought I decided to get the boring ones with no expression of who we are. I figured this way people that wanted to know about us would take the opportunity to ask. And they have. Mostly because of our angel winged kitty stick figure but none the less that leads into many stories of my happy little family. Peoples interests are forever changing but their hearts remain the same. We got the ones from Target, just ordinary that way that don't really have to change until the girls get older. So, I say...the Circus should totally do a stick family and without knowing what all is out there to choose from, I'm not sure I can guide you there. I'd need to look at the selection. But maybe saying less is saying more with those. Perhaps there's more room for change and growth and conversation starters in a more "standard stick people representation." I want one, too! But I never thought it would be complicated. I may need to reconsider!